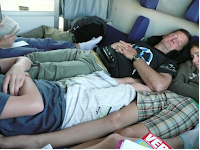 The train travel in Italy has been interesting, as other than on the super fast Eurostar, we are in a compartment with 6 seats that we can pull together that form a kind of bed where we can all stretch out and try to sleep. It is a bit of an art, but with little sleep the night before, it becomes a little easier. We arrived by train in Milan and then had to take a 1 hour bus ride (we didn’t know it would be this long) and then arrived at the airport 1 hour before our international flight to Athens. The Italians, like the French, are very sticky when is comes to rules and we were afraid we wouldn’t be allowed to board. All went well and other than John losing his bottle of Italian wine, corkscrew and Leatherman at security, all went well. Out of all those items, the one we would miss the most was the wine!! Arriving in Athens was easy and after the Olympics, the legacy of trains, freeways and Metro are next to none. 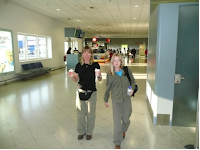 Our place was about one hour northwest of Athens near Corinth and the famous Corinth Canal. 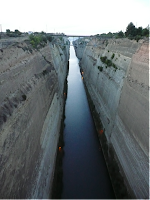 The Corinth Canal was started in 67 BC by Nero using slaves to extract the rock by hand. It was finished in 1893 just after the Suez Canal along his original route. It is over 6000 metres in length and bisects small strip of land that divides the Peloponnese from mainland Greece, saving sailors some 200 miles. The canal is very narrow and the ships are pulled through by tugs. We spent our first day in Ancient Corinth and went to the Temple of Apollo. Paul thought it was just another bunch of rocks and it is pretty hard to imagine what must have been there. In Athens as in Rome we used these little overlap books that showed the past and present, which we could have used here. Our second day we go in to Athens taking the new train and went for lunch at the Plaka and then up to the Acropolis. It is truly an amazing sight to behold and they are further restoring it. There are 4 “buildings” up on the rock (called the Acropolis – think outcropping) and they are the Temple of Athena Nike, the Propylaia (or entrance), the Erecthion and then the Parthenon or the building that everyone thinks of when they see the Acropolis. They have made a new Acropolis Museum and they are moving the antiquities using a 3 crane system from up on the Acropolis down to the ground level. We met up with the father of one of Dave’s friends (Foti) and his mother-in-law Sherry and we went and toured the Monostiraki or shopping streets and then went to their travel agent and firmed up our travel plans to Crete and Egypt. We scored a couple of more books at the place we are staying and will leave some of the ones that we’re finished when we leave. It’s nice to have something to read on the trains and planes and for the beach. It is nice to leave Athens as it is starting to rain and we are hoping to catch some better weather in Crete. We leave in decent time for the airport and are happy that it is Sunday as there isn’t any traffic. We will leave behind the fabulous hotel that we had found and could get our first consistent internet since McNaughton’s place in France.